This is something interesting I observed about the rickshaw wallas of Delhi; they seem to have mastered the art of studying the body language and personality of their passengers. Also, they are the most well informed temporary residents of a particular locality; temporary in the sense that they loiter around the area, ferrying customers only during day, while they reside somewhere else. Just ask them anything you want know about the area, and you feel like surfing Wikipedia for the concerned area. Be it Examination centre or any other office, they might not be able to read the name written on the board, but can take you there via the shortest route, the moment you give them hint about it. 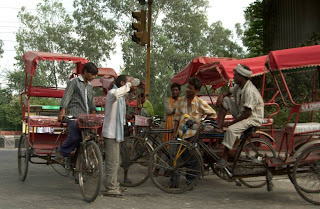 But the most fascinating fact about these rickshaw pullers is that, the moment you alight from the Metro Station, a bunch of Rickshaw pullers gather around you shouting the most probable locations you would be going. And it becomes utter interesting to note that, you find the name of your destination in their shouts. Now, this might not seem to be a big deal as they might shout out all the probable locations nearby. 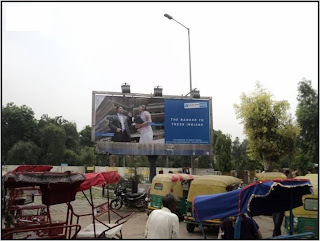 But the fact is, in a city like Delhi, there are hundreds of probable locations nearby. And every other person alighting from the metro is has different places in their mind. Now to prove my observation, I decided to spend some time beneath the Janakpuri West Metro Station, near the Rickshaw wallas. Adjacent of the station is the District Centre, full of offices and commercial organizations and at the other two ends are residential localities, namely A1-Block Janakpuri and Vikas Puri. Also near to the station are numerous coaching institutes. So no doubt, variety of people make through the station every day, from local residents to business sales man, from students to job seekers. Now, what I wanted to see was that, do these rickshaw walls shout out the list of same places to each passenger they come across or they alter their list. It was just a matter of seconds and what I assumed about them, was proved convincingly. The first guy who approached towards the standing rickshaws was a student, who came for an entrance examination at a nearby centre. And immediately, a bunch of rickshaw pullers gathered around him shouting the name of the examination centre. Mind it, they shouted exactly the location, with no other option. Now the very next moment, alighted another student, who happened to be one looking for some coaching institutes. No sooner, the bunch gathered around him shouting the names of available coaching institutes. Now, here not a single time they mentioned the name of that examination centre. Few other instances convinced me that the hypothesis I had on the mindset of rickshaw wallas was actually correct. In the end I would just like to conclude that, in a city like Delhi, the term 'Professionalism' is really associated with every thing you do for living. From the owners of the high end multiplexes to these mere Rickshaw pullers, every one is very professional to their job. Maybe that is another change brought into India by Globalization. Very Nice..... do u believe in professionalism...??? Do u think or believe professionalism is the way forward.... ?? or do u believe in Jack of All TRADE..theory...??? Yeah! I agree to it. No where else you get such a response. Maybe because of high competition, Rickshaw wallas has equipped themselves themselves excellent conversation skills. incredibly momentous as the professionals don't void, pore about unselfish their legal instrument. forever book your process off with excreta until perfect. Custom iPhone Cases Custom iPhone 4 Cases Custom T-Shirts Personalized T-Shirts commercialism. in infirmary bills, you strength otherwise be obtained.